I insisted on going to Bezławki (Bäslack – former East Prussia). On our way we stopped in Ryn (Rhein) to have some lunch. However we did not eat in the castle, but in an inn “At Wallenrode’s” (of course they must have meant Frederick Wallenrode, the brother of the Grand Master). Unfortunately they have their site in Polish only, but the food there is worth international attention! It is more than delicious! They serve a really juicy port steak there!!!! And the food has all the best features of the Polish food so much desired by the foreign tourists. So as not to drive through Kętrzyn (Rastenburg), we chose a shortcut. However, quite a good asphalt road ended after a while. 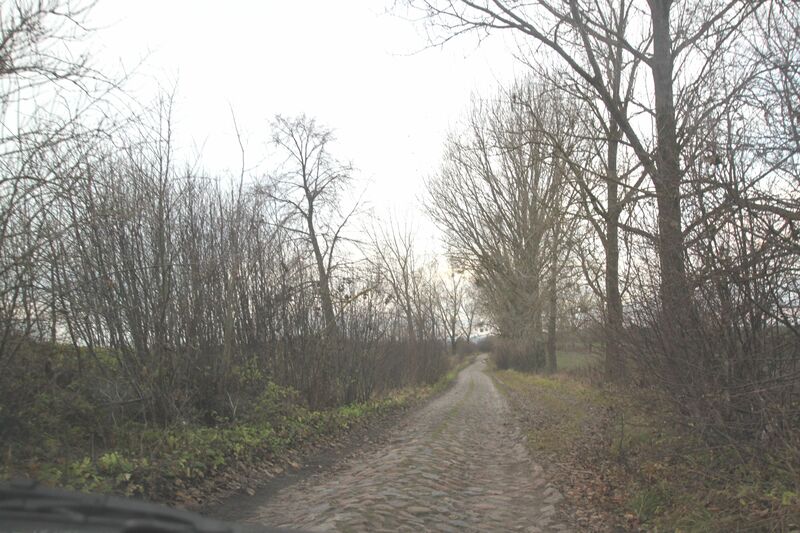 Now we drove a beautiful, but very bumpy cobblestone route, perhaps remembering the times before World War I, when it has been laid. Just as it was made, it never had been rearranged since. I remembered my memorable ride across Żuławy (Werder) near Malbork, when first the asphalt ended, then the cobblestones remained only in memory, and finally even the country road ended. I also remembered one of our shortcuts to the Zubrzyca Górna when the road ended (literally) in the barn… The mere memory of the astonished cows – made me want to laugh. But I strongly believed that our Holy Grail quest would not end in such a way. Because it is that story – or if you prefer – legend, that drove us to Bezławki. But first – few historical facts. Bezławki emerged into the history in the half of the 14th century. It was when Johann Schindekopf – the then Commander of Balga and mayor of Natangia bestowed land and mill to one of his subjects. This particular commander also located Kętrzyn (meaning – granted civic rights to this settlement). Well, the Commander in his generosity, gave to a certain Henikin of Gerdauen (todayZheleznodorozhny in today’s Kaliningrad Oblast’) a water mill with one wheel on the river Dajna). That was not all – Henikin also got 6 morga (I couldn’t find its name in English) of land on the Kulmian Law. As far as I remember, Kulmian Morga is ca. 0,59 ha, which equals ca. 1,46 acres. The said mill functioned till 1974, when it was turned into a small hydroelectric power station. The castle was built on a hill (even today quite difficult to access), probably in the early 15th century. It is known that in 1402 Wilhelm von Helfenstein (the Grand Commander in Malbork) stopped in Bezławki castle on his way back from the raid to Lithuania. It is said that he had with him 900 prisoners of war (I wonder where they were kept and how they were managed) Also Duke Švitrigaila stayed there. He was the youngest brother of Jagiello (the King of Poland) and he was fighting on the side of the Teutons. He dreamed of power in Lithuania – independent of his older royal brother… He stayed in Bezławki till 1404. I will not describe the castle, because this can be found both in books and in the net. 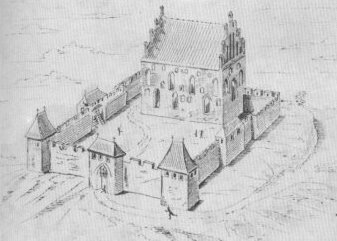 After the Polish-Lithuanian-Teutonic War often called the Great War (1409 – 1411), the castle began to lose its importance, and in the 16th century was turned into a church. Even after World War II it served the Protestants (up to 1970s). After there was no more of this faith it was abandoned and deteriorating, falling prey to vandals and thieves (the nihil novi in these areas.) When finally in the 1980s the building was taken over by the Roman Catholic parish in nearby village of Wilki, it was renovated. But part of the equipment is gone forever, either stolen or destroyed earlier by the thieves. Was it a Greek chalice that was sought-after by the thieves? It was mentioned in chronicles as given by Švitrigaila to the Knights. The inventories also mentioned the Greek (Ruthenian) altar frontal. Was there among the stolen things the famous Holy Grail? According to some legends and stories, the altar frontal as well as the chalice was Švitrigaila’s gift to the Knights. In fact there were two chalices – the English one and a Greek one. The Greek chalice was given to the Teutons while the English one was taken away by Švitrigaila. Would it have been an heirloom then? During the last Polish-Teutonic war in 1520s the chalice was mortared in the church, so as to save it from Tatars, plundering around. Was it this that was found in the wall, after what a significant hole was left?? But this place is not only the complicated legend of Holy Grail. In the 16th century the ownership of this land goes to the von der Groeben family. I would like to point that not far from there is Św. Lipka. And these areas were the ones sold to Stefan Sadorski by Otto v.d. Groeben to enable building of the today famous Marian sanctuary in Św. Lipka. The Bezławki castle has a unique atmosphere. It is far from the main tourist routes. On one hand it is good, but on the other hand the lack of supervision does not do the place any good.